It’s been mentioned here before but I just saw a new trailer for it, so I felt the need to bring it up again. The movie? 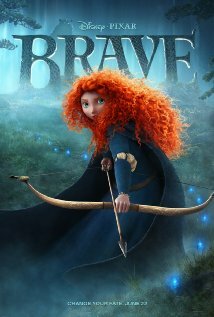 Brave, the latest from Pixar out this summer (June 22!). We have a Scottish princess who longs for freedom, lots of arrows, magic, and I can’t wait. Note: I’ll be linking to trailers that show more of the storyline. If you prefer to be surprised, look away. However, since I’m definitely taking the kiddos to see it, the more info I have, the better for us. It was enough to make me sit up and take notice, and got the kids interested too. There was a second trailer that gave a little more info and introduced some other characters, but there was still a lot left out. Can I get a “Hell, Yeah!” I LOVED it. Loved the interaction with the parents, the tiny details (notice the slight cut on her cheek when she fires the last arrow), and Merida! This is a character I can root for. Because Youtube is an addictive beastie, I scrounged around a bit and found this little gem: the Japanese trailer for Brave (there are English subtitles). Here you get quite a bit more story info, and some details on the eventual battle/showdown/how Merida gets her fight on.